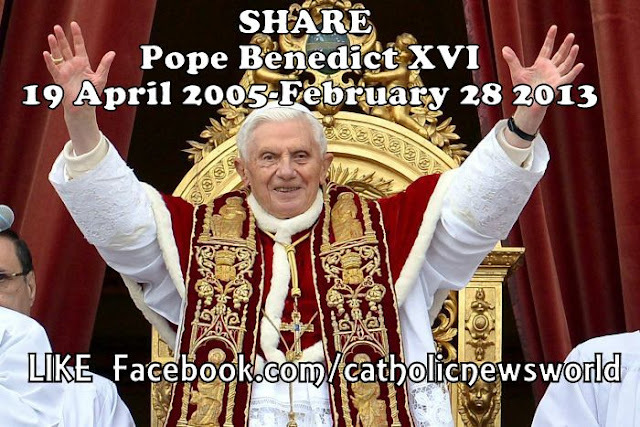 Catholic News World : Top 10 Quotes of Pope Emeritus Benedict XVI to SHARE - Powerful #BenedictXVI Quotes to Change your Life! Top 10 Quotes of Pope Emeritus Benedict XVI to SHARE - Powerful #BenedictXVI Quotes to Change your Life! 1. Every human being is loved by God the Father. No one need feel forgotten, for every name is written in the Lord's loving heart. 2. Believing is nothing other than, in the darkness of the world, touching the hand of God, and in this way, in silence, hearing the Word, seeing love. 3. Truth is not determined by a majority vote. 4. In the Eucharist, the Son of God comes to meet us and desires to become one with us; eucharistic adoration is simply the natural consequence of the eucharistic celebration, which is itself the Church's supreme act of adoration. 5. Children truly are the family's greatest treasure and most precious good. Consequently, everyone must be helped to become aware of the intrinsic evil of the crime of abortion. In attacking human life in its very first stages, it is also an aggression against society itself. Politicians and legislators, therefore, as servants of the common good, are duty bound to defend the fundamental right to life, the fruit of God's love. 6. Celibacy for the sake of the Kingdom means embracing a life completely devoted to love, a love that enables you to commit yourselves fully to God's service and to be totally present to your brothers and sisters, especially those in need. 7. Because the truth of God is love, conversion to God is conversion to love. 8. With the Rosary, we allow ourselves to be guided by Mary, model of faith, in meditating on the mysteries of Christ, and day after day we are helped to assimilate the Gospel, so that it shapes all our lives. 9. The new evangelization ... begins in the confessional. 10. Friends, do not be afraid of silence or stillness. Listen to God. Adore Him in the Eucharist.